This is in partnership with Citi, who sponsored my weekend at Global Citizen Festival, however all thoughts and opinions are solely my own. “One thing that I've learned from my work is that passion informs purpose. It's a good starting point. You can do anything from there,” says Denis Muwanguzi in his soft and slightly accented English. Denis and I come from opposite ends of the Earth – he from Uganda and myself from Hawaii. They are almost exact antipodes and yet we're both here, very far from home, at a dining room table on a late Sunday afternoon in New York. Denis and I are just two of more than 60,000 artists, advocates, and music lovers brought together by this weekend's annual Global Citizen Festival. I am here in New York working with Citi, a major partner of the Global Citizen Festival since 2012. They asked me to join them to help share the individual stories of the GCF community and shed light on their commitment to progress. I came to this festival with them because of a shared belief in personal empowerment – a value also reflected in Denis’s presence. He is attending as a speaker and Global Citizen Youth Advocate for his innovative work in rural Uganda's public health sector. At any other music festival Denis's involvement – along with the participation of UN representatives, foreign ministers, and leaders of both businesses and NGOs – might seem a bit odd. 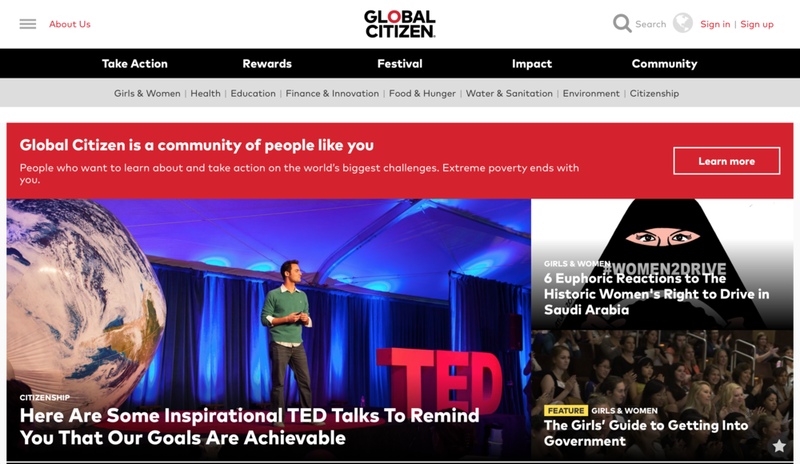 Global Citizen Festival, though, is a platform as equally dedicated to social change as it is to amazing music. Rather than paying for entry tickets, GCF asks festival goers to earn their tickets by learning about and engaging in actions to collectively tackle global issues. It's a concept I love. This year more than 1.6 million actions were taken and include everything from tweeting and emailing world leaders to signing up to volunteer with certain organizations. It's an amazing merger of art and advocacy. It was my first time attending and I really didn't grasp the magnitude. More than at any other concert I felt a sense of camaraderie with the thousands of faces around me. One moment we stood in hushed silence as Dr. Jane Goodall (the famous primatologist and conservationist) made an eloquent argument for kindness, both to animals and to our fellow humans... and the next we were jumping and singing together to The Lumineers, while the little crescent moon hanging in the sky shone above the New York city skyline. I listened to Big Sean while learning about ending world hunger. The festival is wild. It's the duality of human nature – with its deep thinking and lightheartedness all rolled up into one. My take aways from Global Citizen Festival? Just start somewhere. (That's what GCF does, it can't make anyone change the world, but it can motivate people who might not yet be engaged in social justice.) Then once you start, keep going. Being a global citizen is not a quick fix, it is an ongoing and ever engaging process. Life is, as Denis called it, “a fluid path” so don't be afraid of where that may take you. The importance is in beginning. What small whisper are you not giving space to grow? “I didn't have money, I didn't have space. All I had was knowledge in this field that I'm passionate about,” he says telling me about his path to co-founding the Suubi Health Centre with his family. For years they taught public health education classes under the shade of a single mango tree. No building, a mango tree. Now their facility provides to access to healthcare for a community of 260,000 people and Denis is hoping his model could provide a scaleable solution for the entire country. You start somewhere, you keep going. It's something I'm inspired to dedicate myself more to after this weekend. Denis and I meeting is a microcosm of the entire event: people coming together from vastly different backgrounds and causes to talk, to sing, to use our voices digitally or physically. To put a face to an issue I might not know otherwise. This cross pollination of ideas from so many sectors is where innovation happens. At the individual level we create microcosmic changes. Collectively, these actions tangibly and track-ably change the world. The event was amazing. Now. Let's. Keep. Going. Thank you Nainoa Langer for collaborating with me on the video above and to Citi for believing in me and for their continued support of the Global Citizen Festival and community.